Read the full report, What is the best disposal option for the "Leftovers" on the way to Zero Waste? Landfill gas capture rates are a contentious issue and a large factor in determining the environmental impacts of burying leftovers, particularly when the leftovers contain high quantities of organic materials. We chose two landfill gas capture rates to reflect the uncertainty in this area. We also chose to model no landfill gas capture for post-MRBT leftovers because the material will not be biologically active and will produce little to no landfill gas. There was not estimated to be enough gas production from the MRBT leftovers to warrant a LFGTE system. Our decision to run the model at 40% and 80% gas capture rates was to offer some sensitivity analysis around how the rates affected the environmental performance of landfills. Our lifecycle analysis measures the impacts over a 100-year period, and there is no empirical data on landfill gas capture rates over that time period since the technology and practice are relatively new. The data shows that a landfill with a higher gas capture rate would have a lower environmental impact, but the report does not imply that 80% gas capture is feasible. The report also clearly shows MRBT outperfoms landfill gas to energy systems, even at the assumed high gas capture rates. The residual material after MRBT processing is not considered to be marketable and is sent to a landfill for disposal. Some MRBT facilities may produce a stabilized inert residual that can be used for specific applications such as land reclamation of old mines and landfills, or landscaping along railways and highways, but this was not considered in our study. Using the MRBT residual instead of landfilling could increase the environmental benefits of using MRBT by displacing the use of a substitute material with a higher pollution profile. The energy generated by WTE and LFGTE facilities was assumed to displace electricity that would have otherwise been produced by natural gas. Natural gas is replacing coal as the dominant source of new energy in the US. These are valuable resources, not "trash." Many of these materials could be recycled or composted but are not sorted properly. The amount of leftovers decreases in a community with high recovery goals and strong programs for recycling, composting and reuse. What's left over today may not be in a few years or may change in composition as more materials are recovered. This underscores the need to design disposal facilities for fewer and fewer tons, instead of investing in technologies that rely upon a steady stream of tons with high energy content. Why did you choose Seattle for your model? We wanted to model a community on the cutting edge of resource recovery and we also needed a communtiy with good data on what was left in their trash bin. Seattle has one of the best recycling rates in the US and had a recent waste composition on its leftovers so it became our model community. Does that mean 70% recycling is the best achievable recycling rate? Absolutely not. Nearly 90% of a community's discards can be recovered and marketed. Much of Seattle's remaining waste could be recycled or composted instead of ending up in the trash. For example, nearly 29% of Seattle's leftovers was food waste that could have been composted. Almost 19% was paper that could have been recycled or composted. Seattle households could certain reach higher recovery rates and will continue to do so. Their current recycling rate of 70% is a great accomplishment but is not the final goal. What do the environmental categories, such as ecotoxicity and eutrophication, represent, and how do you place a monetary value on pollution and health risks? For more information on the types of pollution assessed and their associated monetary values, please read the background documentation on the MEBCalcTM model. European countries are leading the movement to pre-process leftovers for additional recycling and biological stabilization. This is driven by European Union policy, the Landfill Directive, which reduces the amount of biologically active materials that can be landfilled. Germany has gone one step further in banning the direct landfilling of any materials, requiring all leftovers go through a pre-treatment process. There are more than 330 plants in Europe processing 33 million tons per year, with more than 450 plants expected by 2016. Can we use MRBT instead of having people separate materials for recycling and composting? While MRBT facilities are able to recover some recyclables from the leftovers, these facilities are not able to sort and market many of the materials because they are too dirty and contaminated from the other leftovers. For example, the compost from MRBT facilities is often not marketable as a soil amendment and is commonly buried in the landfill. MRBT is a solution for treating leftovers after source separation efforts and is not a substitution for having residents and businesses separate their discards. Source separating materials for recycling and composting, such as cardboard, plastic bottle and food scraps, guarantees the highest economic value and greatest environmental benefits from recovering these materials. Why is managing residuals important--shouldn't communities focus on increasing recovery efforts first? Communities should absolutely give top priority to increasing the availability of and participation in recycling and composting programs to recover materials from their discards. Infrastructure investments are a big part of this effort and it is important for a community to consider how its discards stream will change as recovery rates increase. By looking ahead and considering the best options for managing its leftovers in the present and the future, a community can avoid investing in disposal technologies that are not compatible with a decreasing amount of leftovers or cause excess pollution and environmental health impacts. Pre-processing leftovers through MRBT facilities may also help communities reach their other environmental goals such as minimizing air and water pollution and reducing greenhouse gas emissions. For further information about this study and our findings, contact the authors. What is the best disposal option for the "Leftovers" on the way to Zero Waste? 3. Mechanical Recovery, Biological Treatment followed by landfilling (MRBT-to-landfill) with two different assumptions for therecovery of recyclables and two different assumptions for gas collection efficiencies. We then used the Measuring Environmental Benefits Calculator (MEBCalcTM), created by Dr. Jeffrey Morris, to assess each leftovers management scenario across seven lifecycle environmental impacts: climate change, acidification, eutrophication, respiratory diseases, non-cancers, cancers, and ecotoxicity. The environmental impacts are caused by the pollution emitted from the various waste management activities used to handle discarded products, packaging and other materials for recycling, composting or disposal. >> Download the report for our full findings and approach. >> Download the press release. >> Contact the authors about presenting at conferences or webinars. 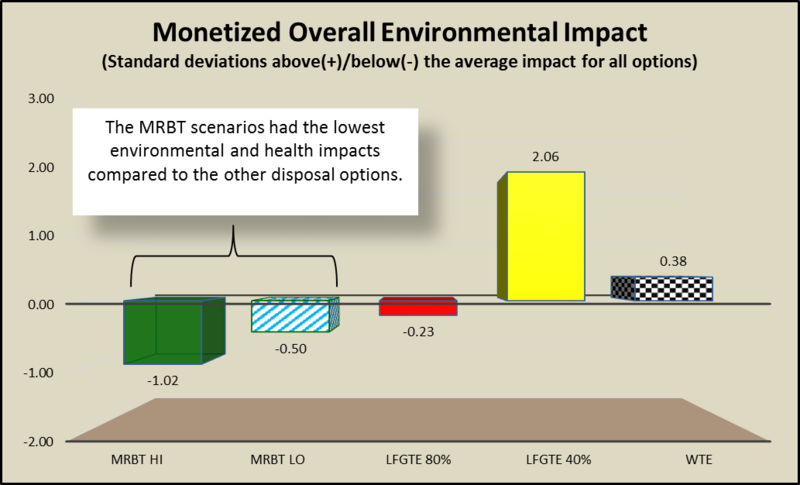 The study found MRBT-to-landfill had the lowest overall environmental and human health impacts of all the disposal technologies. It is reasonable to conclude that the MRBT option is not only the best environmental practice for managing residuals, but is also the best community strategic option as well. MEBCalc™ (Measuring the Environmental Benefits Calculator) is Sound Resource Management’s proprietary software for computing the environmental footprint of a community’s municipal solid waste (MSW) management system, from collection through final disposition of each discarded product or packaging material. Environmental impacts covered in the footprint include climate change, public health (respiratory disease, cancer, and toxicity), ecosystem toxicity, waterway nutrification, and acid rain. Learn more about MEBCalc and Sound Resource Management. >> What's the best way to manage "Leftovers" on the way to Zero Waste? What's best to do with "Leftovers" on the way to Zero Waste? Read the full report and learn more about the study. In several Zero Waste programs across the country, plastic-coated paper products like milk cartons and coffee cups are accepted in compost bins. Eco-Cycle has funded groundbreaking research from the highly-respected Woods End® Laboratories in Maine and international composting expert Will Brinton showing that these plastic coatings DON’T go away in the composting process. In fact, the plastic breaks down into tiny micro-particles, not visible to the naked eye, that remain in the compost and eventually make their way into our soils and waterways, adding to the growing problem of plastic pollution in the environment. In addition, new research indicates that micro-plastics may be harmful to living organisms in many ecosystems. View our groundbreaking research and check out our toolkit to help make sense of the different types of food packaging on the market today, what products are safe to include in composting programs, why plastic coatings pose a serious threat to our environment, and now who’s meeting best practices with plastic-coated food packaging. Take action in your community to keep plastics out of our environment. Throwing leftover food, yard debris and paper into the trash doesn't just take up space in landfills--it creates a powerful greenhouse gas and robs our soils of valuable nutrients. Learn how to achieve significant climate benefits RIGHT NOW by PREVENTING landfill-produced methane. 1. Seize the Paper: Commit to recycling a minimum of 75% of all paper and composting the rest by 2012. 2. Source Separate: Require source separation of residential and business waste into three streams: compostables, recyclables and residuals. 3. Feed Local Soils: Support local farmers and sustainable food production with community composting infrastructure. 4. Stop Creating Methane: Public policy needs to first support the elimination of methane by requiring source separation of compostables and recyclables, then mitigate methane from existing sources where organics have already been buried. Stop Trashing the Climate, co-authored by the Institute for Local Self-Reliance, Eco-Cycle and GAIA, proves a Zero Waste approach is one of the fastest, cheapest and most effective strategies to protect the climate. Significantly decreasing waste disposed in landfills and incinerators will reduce greenhouse gas emissions the equivalent to closing 21% of U.S. coal-fired power plants. This is comparable to leading climate protection proposals such as improving national vehicle fuel efficiency. Indeed, preventing waste and expanding reuse, recycling, and composting are essential to put us on the path to climate stability. The pioneers of the Zero Waste movement in the U.S. —Eco-Cycle among them—were very clear in the mid-90s that zero waste to landfill was not the same thing as Zero Waste. Zero Waste is about making the best choice with our natural resources — from extraction to production to consumption to disposal. It involves a constant evaluation about our materials’ choices and a strong commitment to eliminating waste, not just treating it. Learn more and download Waste OF Energy: Why Incineration is Bad for our Environment, Economy and Community. The business community has embraced the concept of Zero Waste as a way to improve efficiencies, reduce production waste and save money. Unfornately there has been a wave of initiatives under the guise of "Zero Waste to landfill" which are accepting high levels of waste incineration. Read our position paper on why Zero Waste to landfill is not Zero Waste.